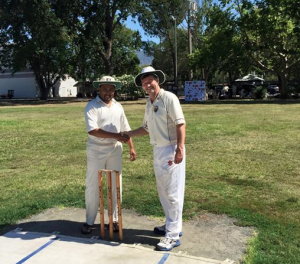 NVCC’s Tim Irwin produced a textbook display of fast bowling to set the groundwork for what turned out to be a narrow, grinding victory for the local team against the Sri Lanka Socials in Calistoga recently. Supported by an all-round solid bowling and fielding display, Irwin’s five wickets for just 12 runs off his seven overs kept Sri Lanka to a modest total of 132. That being said a batting collapse necessitated a rear-guard action with the bat by NVCC captain Bernie Peacock and Phil Bourke with an undefeated ninth wicket partnership of 29 to finally get NVCC across the line later in the day. The day started with Sri Lanka winning the toss and electing to bat. Peacock chose a fast-slow combination of Irwin and Kiranpreet Singh to open the bowling and to good effect. Sri Lanka had only made it to five when Singh struck, bowling the opening batsman Indi for a duck. This was soon followed by a great run-out by new American recruit Peter Cameron, in only his second game, with a direct hit leaving the other opener, Imti, short of his crease and Sri Lanka in trouble at two wickets for 24, and soon three for 27. Sri Lanka settled in with Anushka putting on a hard hitting 52 off just 26 balls, supported by Tivanka with 23 and had progressed to five for 118 before Irwin produced a stunning spell. He cut through the middle order with four wickets for two runs in the 23rd and 25th overs, before finishing off the innings by running out the final batsman shortly afterwards. After lunch Napa started their chase in fine style with the young Moe Maqsood joining veteran Bijoy Ojha in the opening partnership. With Maqsood in particular hitting aggressively the pair raced to 50 in the seventh over before Ojha was given out LBW (Leg Before Wicket) for 19, somewhat controversially as the ball appeared to hit his bat before his pads. Maqsood then fell in the next over trying to go for one more big hit, caught for 30. Still looking comfortable at two down for 55, Napa’s middle order slowly progressed the score along, losing an occasional wicket along the way before losing a cluster of wickets in quick succession. NVCC were suddenly in trouble at seven for 89. Newcomer Cameron then joined Bourke at the crease and the two settled the ship a little, adding 15 to bring the total to 104 before Cameron fell. Peacock then joined Bourke, needing 29 with just two wickets in hand, and survived an early chance when the wicket keeper put him down before he had scored. This proved to be Sri Lanka’s last chance though as the veteran pair carefully worked on the deficit before Bourke hit the winning run in the 29th over. After the match, captain Peacock presented the Clos du Val Man of the Match award to Sri Lanka’s Anushka for his 50 with the bat. NVCC President Phil Bourke then presented a Napa Cricket “Baggy Maroon” cap to Colin Nolan, playing his last match for the club before moving to New Zealand. 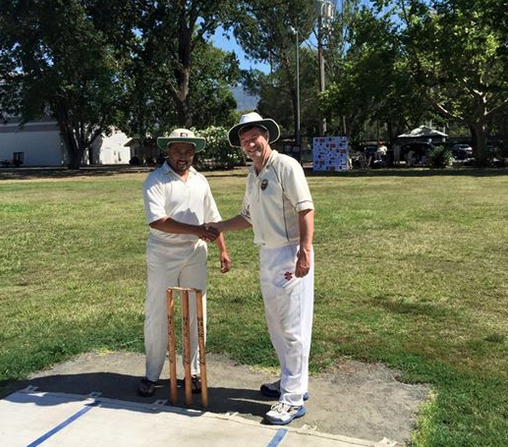 Napa Valley CC Batting – Moe Maqsood 30 off 26 balls (3 x 6), Bijoy Ojha 19 off 17 (2 x 4), Bernie Peacock 14 Not Out off 23 balls (1 x 4), Phil Bourke 11 Not Out off 33 balls (1 x 4). Napa Valley CC Bowling – Tim Irwin 5 wickets for 12 runs off 7 overs, Bernie Peacock 1 for 8 off 4.2, Kiranpreet Singh 1 for 21 off 5. Clos du Val, Silverado Resort, Compadres Rio Grille, Tonnellerie Saint Martin, Penfolds, St. Helena Optometry, First Priority Financial, Anchor Steam Brewing, Amcor, Joseph Cellars, Ciatti & Co., Biagi Bros., Rebel Dog Hot Dogs, Stone Universe, Lyve Systems Inc., Calistoga Roastery, TricorBraun WinePak, 3 rock marketing, Napa Gourmet Foods, Napa Valley Body Connect.